Grown in NZ, made in NZ. 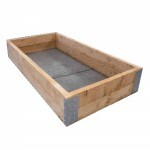 Natural Macrocarpa raised garden beds offer the home owner an ideal way to establish a garden for growing vegetables, flowers or for the propagation of plants. 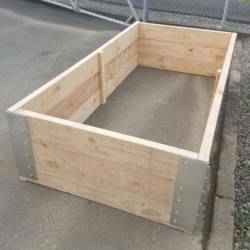 All our raised garden beds are made from untreated Macrocarpa, which has a natural resistance to fungus, rot and insect attack. It is therefore durable and long lasting without chemical treatment. Recent research shows timber treatment chemicals (CCA – Copper Chromium and Arsenic) can leech from wood into your soil and plants, thereby posing health risks. Untreated Macrocarpa is a safe and organic alternative to CCA treated timber beds. Macrocarpa will gradually weather to an attractive silver grey colour as shown in several of the photos. It can also be stained if preferred. Very easy assembly. The macrocarpa garden bed pictured is the 2 board (300mm deep) option, may not be the same size described above and is for illustration purposes only.